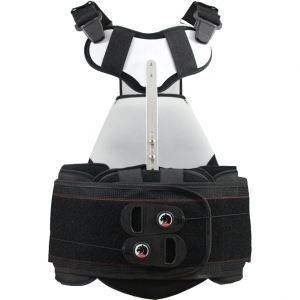 The Panther TLSL spinal brace delivers maximum spinal control. The posterior-lateral shell, rigid anterior plate, and twin lateral plates overlap to provide circumferential support & control. 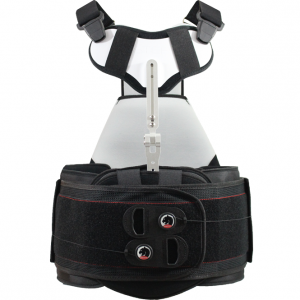 With its sternal plate (STEP) and attached shoulder straps, the Panther TLSL offers triplanar control from the symphysis pubis to the sternum anteriorly and from the gluteal fold to the scapular spines posteriorly. The string-and-pulley compression system allows for easy cinching, even by elderly arthritic hands. The universal Panther TLSL requires no tools to fit. There’s no need to cut or fold a belt. Just add or remove belt segments. 25” to 66” and beyond! Just add extra belt segments. The Panther TLSL’s posterior plate auto-conforms to the patient’s lordosis as the brace is tightened.